Facebook’s image sharing platform, Instagram, has been called out for copying rival Snapchat’s features a number of times. Right from Stories to Face Filters, Instagram has copied a number of features from Snapchat, but now it seems like the tables have turned. Snapchat recently started testing mention tagging in Stories, a feature which has been available on Instagram since November 2016. According to a report from TechCrunch, Snapchat is currently testing mention tagging, which will allow users to tag a friend in their Story. Once tagged, viewers will get a new swipe up option on the Story which brings up the tagged person’s name, handle, Bitmoji, and an Add button. The feature is inteded to help users call out their friends or promote their favorite influencers. The feature works almost exactly like tagging on Instagram, allowing users to add text with “@[username]” to mention a particular user in their story. 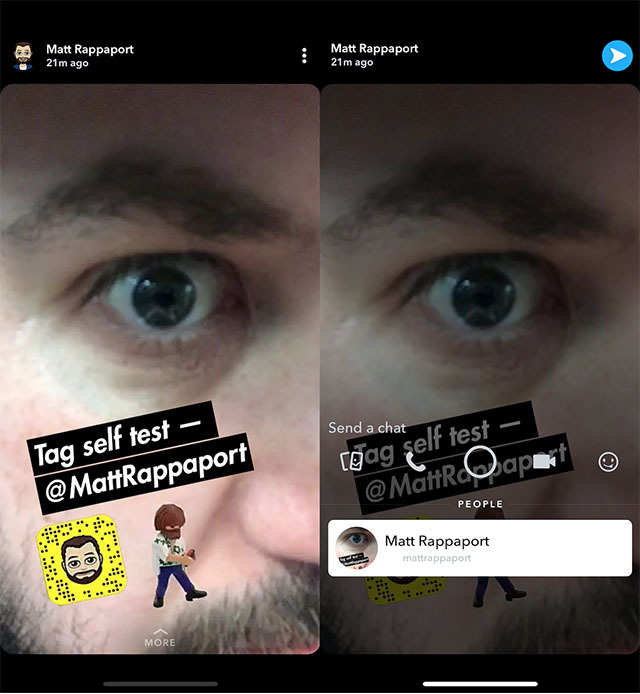 Just like Instagram, the tagged user is notified when they’re mentioned in someone’ story, but this feature currently only works then the tagged user is also part of the beta testing. The company has released no information about a definite release timeline for the new feature.